I was in Starbucks the other morning, which isn't that unusual. It's also perfectly normal that they ask your name these days and write it on the cup. I've never been overly comfortable with the implicit intimacy of someone calling me by name when they are just selling me a coffee, but I've learned to live with it since Starbucks made giving your name a mandatory condition of getting a coffee. 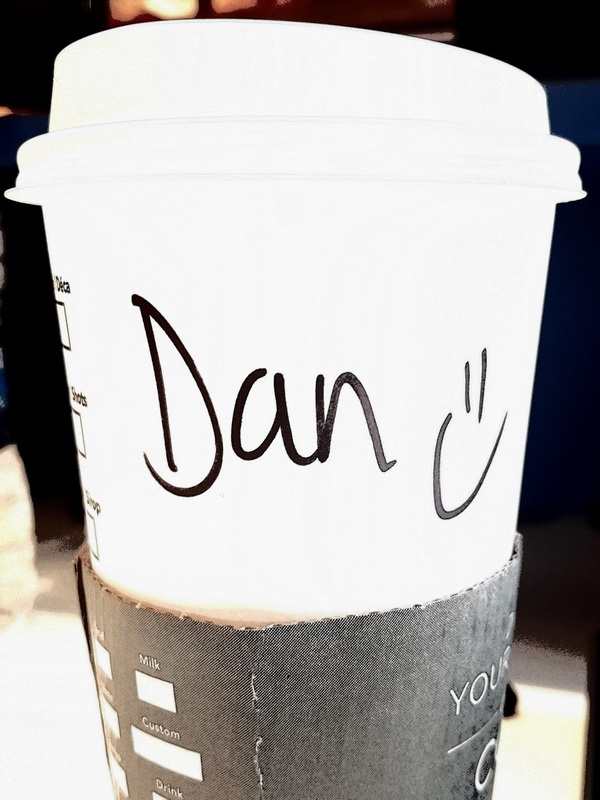 But this morning the thing which particularly rankled me was not - as you may be suspecting - the smiley face he drew next to my name, but rather what the guy serving me did with my name after I'd given it to him. I'm used to being upsold. In WHSmith they seem to have moved half the the stock of the store next to the till to try to sell you for a pound whenever you buy some stationery, and in Starbucks I'm quite used to being asked if I'd like a muffin with my morning coffee. This morning though, the guy used my name in a very friendly tone when trying to sell me a muffin. It felt uncomfortable and jarring, as though I'd given my name for one purpose and he'd used it for another. I'd given it to be used to identify my coffee when it arrived at the other end of the counter but he'd taken this as licence to become "all friendly" with me, and try to cajole me into buying a muffin. I've always had an uneasy and slightly mutually suspicious relationship with my name. I never really liked the name "Daniel". Not for me, anyway - I don't find it a particularly ugly or unpleasant name on other people, but never felt it quite fitted me. I was "Danny" to some people during my teenage years and early twenties, but gradually became "Dan" to pretty much everyone. I've always found it quite irritating to have someone else dictate to me what I should be known as. Of course, my parents chose my name when I wasn't able to and at least they chose better than they could've done - I believe that my Mum wanted to call me "Blue" at one point. But since I've been old enough to know what I'd like to be called, I don't think it's unreasonable of people to respect it. The catalyst for me changing my name legally to just "Dan" was something quite small, and if I tell the story in isolation it sounds like a large step to take in response to a small annoyance, but in reality I'd been frustrated by being known as "Daniel" for a while, given that it wasn't the name I ever used if given a choice. At work, the IT team insisted that my email address and company directory entry had to be my full name, and so as I started to work with more people outside my immediate team and even outside the company, more people started referring to me as "Daniel" and I didn't really feel that I could say "actually, please call me Dan" to everyone all the time. And so I legally dropped the "-iel" from my name. It was quite a relief, and now all of my official documentation is "Dan" and I'm only ever "Daniel" when someone makes an assumption about my name. Which people do. I don't really blame them for it. Generally, if someone (like my new company) makes that assumption, they are quick to correct it, but I did run into some trouble with my GP's surgery. It's now six years since I first told them that my name is "Dan" and not "Daniel" and just two weeks ago I picked up a prescription with the name "Daniel McNeil" written across the top. It doesn't really matter too much, but I asked the receptionist to correct it on their system and in return got something of a lecture on the difference between a legal name and a preferred name, and how my GP had to use my legal name. But then again, the receptionists at GP surgeries are never the most helpful people in my experience. And in any case, I have an NI number which identifies me uniquely, which my name obviously doesn't - as attested by the number of tweets I used to get for this guy on Twitter. But whatever someone calls me, I have always had a distaste for people using my name to presume an intimacy which isn't there. If I call the electricity board to talk about a meter reading, I don't see why the person I'm speaking to and I must start to call each other by name. It's not that I want to be rude to them, but the whole exchange of names - and even worse then they start to ask "how's your day been so far?" - seems like unnecessary wasting of time. It's no disrespect to either of us if we speak about the meter reading and then hang up.